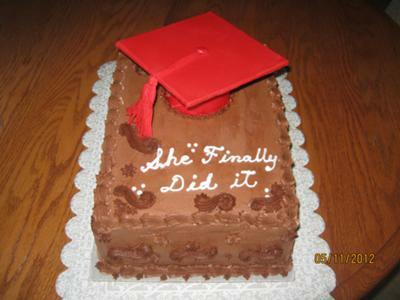 This graduation cake is a 1/4 sheet chocolate cake filled and frosted with chocolate buttercream. Fondant covered cupcake and board for grad cake. The cap tassel is fondant strips. All of the cap fondant was colored red per the grads request. The hand decoration was done with a number 21 tip. VERY NICE CAKE AND SOUNDS SO YUMMY. Return to April 2012 Cake Decorating Contest Submission Form.